When you register as a patient of our practice, you provide consent for our specialists and practice staff to access and use your personal information so they can provide you with the best possible healthcare. Only staff who need to see your personal information will have access to it. If we need to use your information for anything else, we will seek additional consent from you to do this. During the course of providing medical services, we may collect further personal information. Information can also be collected through electronic transfer of prescriptions (eTP), My Health Record, eg via Shared Health Summary, Event Summary. We may also collect your personal information when you visit our website, send us an email or SMS, telephone us, make an online appointment or communicate with us using social media. Your personal information may be stored at our practice in various forms eg as paper records, electronic records, visual records (X-rays, CT scans, videos and photos) and audio recordings. Our practice stores all personal information securely in electronic format secured by passwords. Our practice acknowledges patients may request access to their medical records. We require you to put this request in writing and our practice will respond within a reasonable time (usually 30 days). Our practice will take reasonable steps to correct your personal information where the information is not accurate or up to date. From time to time, we will ask you to verify that your personal information held by our practice is correct and current. You may also request that we correct or update your information, and you should make such requests in writing. We take complaints and concerns regarding privacy seriously. You should express any privacy concerns you may have in writing. We will then attempt to resolve it in accordance with our resolution procedure. 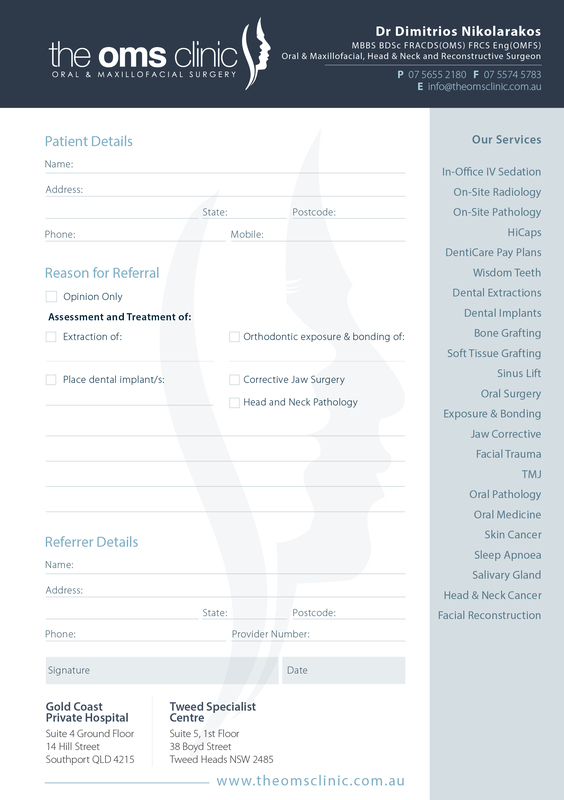 Our email address is info@theomsclinic.com.au or alternatively you can send your complaint by mail to Suite4, Ground Floor, Gold Coast Private Hospital, 14 Hill Street, Southport, 4215 QLD We aim to reply within 30 days of receipt. You may also contact the OAIC. Generally, the OAIC will require you to give them time to respond before they will investigate. For further information visit www.oaic.gov.au or call the OAIC on 1300 363 992. We do not collect personal details via our website.